The Theatre Ensemble is opened to any student interested in stage performance, singing, dance and technical support. A fall show and spring musical provide students with the full theatre experience, including auditions and rehearsals to performance on opening night. Check us out-click here! An honor opened to students who have completed 3 years of a language, and have maintained a 90 or above average in the language, and 80 or above in all other subjects. Members are called upon to provide tutorial service within the school community. Membership in this prestigious organization is opened to recommended juniors and seniors who have achieved and maintain a 3.40 or above GPA. Society members must demonstrate the attributes of character, leadership, scholarship and service. The Archbishop Williams High School chapter of NHS was founded by the Sisters of Charity of Nazareth in the 1950's. 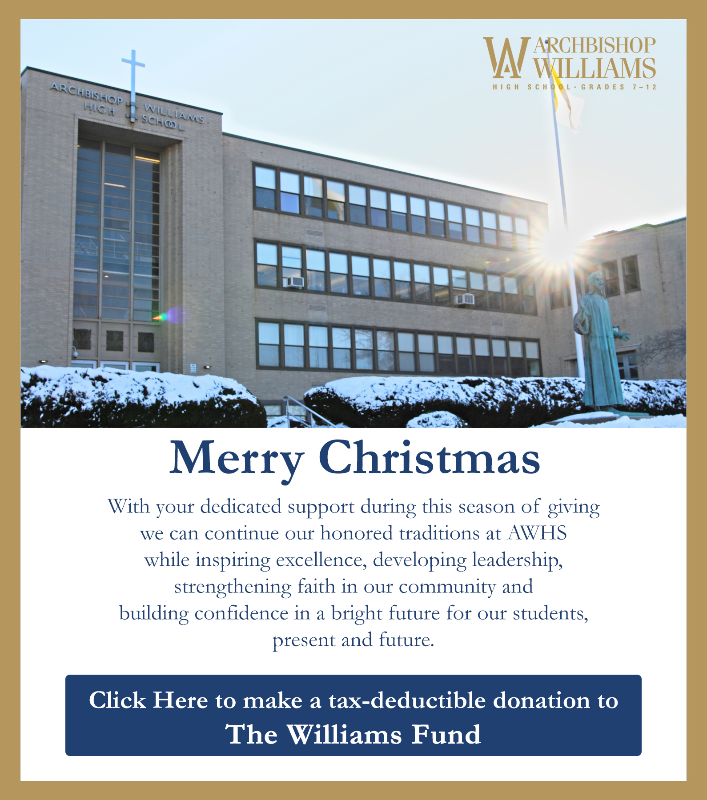 The Admissions Council is composed of selected sophomore, junior, or senior students who are eager to introduce prospective students and their families to Archbishop Williams High School. Students are trained to be tour guides for AWHS Open Houses and "Ambassadors", who address Middle School students in their home schools. The AWHS Math Team provides an academic opportunity for students who excel in mathematics to compete with their peers at other high schools. Members meet weekly to develop their critical thinking and creative problem solving skills while solving challenging problems as they prepare for the competitive season. Working together as a team, students strengthen their understanding of mathematical concepts needed for each meet. The AWHS Math Team competes in the Southeastern Massachusetts Mathematics League. The Archbishop Williams Student Council is a busy organization. The Council is open to all students who enjoy participating, creating and facilitating activities that nurture the proud Williams spirit. HOMECOMING, SPIRIT WEEK, SENIOR ASSEMBLY AND BREAKFAST, SEMI-FORMALS, SPORTS RALLIES are just some of the events that the Council oversees. Additionally, the Council gives students a place to voice their views on school life, develop leadership skills and provide service to their school and local communities..
Students interested in computer technology will find a place to channel their interest in the Technology Club! Members are given the opportunity to explore new technology while honing their technology skills. Members provide service to the school community by addressing computer problems that arise, and assisting in the workings of the AWHS website, the Yearbook, the Mitre, and the Radio Station. The Club meets weekly and is open to all students. The "Crew" offers service to the school community by sharing their technical skills on light and sound boards, and carpentry skills in set design. The Tech Crew supports school events such as liturgies, plays, rallies, and auditorium presentations. Tech Crew is opened to all students who are either interested in learning tech skills or are already trained. Yearbook gives students the opportunity to "tell the story of a school year in a responsible and creative way." Any student may be part of the yearbook process that has the flexibility of on-line meetings and work. The final product, The Crosier, is published in the spring followed by a fall supplement.